The Great Wall is a potent Chinese cultural icon. The relics of the Great Wall and its fortresses and watchtowers show us China&apos;s culture of national pride, grand projects, and determined resistance, but also its culture of extravagant architecture and art. There are many paintings, poems, operas, stories, and legends inspired by the Great Wall. Nowadays the Great Wall exemplifies a culture of preserving cultural heritage, and greater openness to the outside world, with the Great Wall becoming China&apos;s greatest tourist attraction. Great Wall paintings, embroidery, décor, photography, and post cards are a modern Chinese art form. The Great Wall is a powerful symbol. It represents the unification of China, because it was linked together as China was unified for the first time in the Qin Dynasty (221–206 BC). It represents the awesome ability of the Chinese to work together for the good of the country. 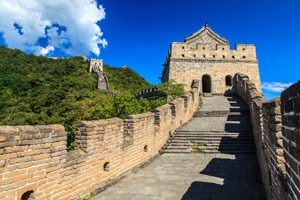 While it represents unity on the China side, the Great Wall represents separation from the rest of the world on the other, along with the lengths a nation will go to preserve their culture and keep invaders out. Ironically, as a tourist attraction, the Great Wall is now helping to draw millions of outsiders in to China to experience Chinese culture. China welcomes you! The majestic Great Wall was built with wisdom, dedication, blood, sweat and tears. Many legends and myths exist regarding the building of the Great Wall. This story of love and devotion was set in the time of the Qin Dynasty Great Wall. A girl named Meng Jiangnü (孟姜女, /mnng jyang-nyoo/, family name: Meng, &apos;Ginger-Lady&apos;) saved a man named Fan Xiliang (范喜良, /fan sshee-lyang/, family name: Fan, &apos;Delight-Good&apos;). They fell in love with each other and got married. Unfortunately, Fan Xiliang was found, captured, and returned to forced labor at a Great Wall construction site. Meng Jiangnü waited day and night for her husband. Winter came, but Fan Xiliang failed to return. Meng Jiangnü sewed some warm clothes to take her husband. She arrived at the construction site, but Fan Xiliang was nowhere to be found. 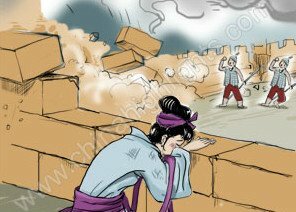 She was then informed that Fan Xiliang had died and his body was built into the Great Wall. Meng Jiangnü stayed by the wall and wept for days and nights. 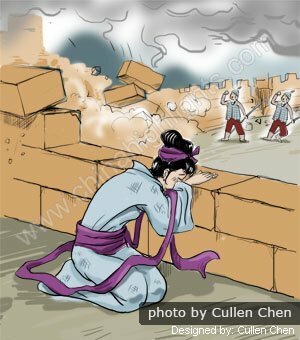 Deeply moved by the girl&apos;s bitter weeping, the Great Wall collapsed and she finally found Fan Xiliang’s body. The Temple of Meng Jiangnü can be found 5 km northeast of the Shanhai Pass Great Wall Fortress. There is an underwater section of the Great Wall in Hebei Province called Xifengkou (喜峰口 /sshee-fnng-koh/ &apos;Happy Peak Pass&apos;). A legend relates that in the Qin Dynasty (221-206 BC), a young man was taken away to build the Great Wall. Winter came, but he failed to return. His father worried about him so much that he went to the site to look for him. They ran into each other at Songting Hill by chance. They were so happy that they laughed themselves to death. The pass where they were buried was later named Xifengkou Pass. During the construction of the Ming Dynasty Great Wall, Emperor Yongle (reigned 1402–1424) ordered a general named Cai Kai (蔡凯 /tseye keye/ &apos;surname Cai&apos; &apos;Victorious&apos;) to build the Huanghuacheng Section of the Great Wall. Cai Kai employed meticulous quality control and spent several arduous years to finish this task. However, he was hastily beheaded when the ministry of war got wind of his extravagance. The emperor realized he had wronged Cai Kai after an official found the wall to be extraordinarily solid and steep. Later, the emperor built a tomb for Cai Kai to commemorate his great contribution and named this section "Metal Soup" Great Wall, due to its solidity. 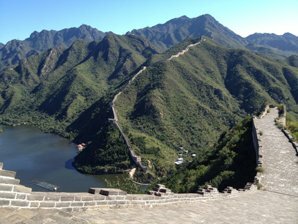 Read more on the construction of the Huanghuacheng Great Wall section. The Great Wall was not only to keep invaders out, but was also a communication system. 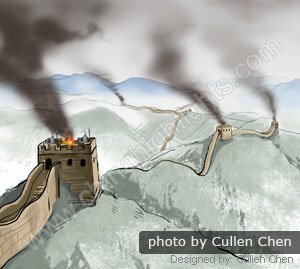 The Great Wall had beacon towers every few kilometers, from which soldiers communicated in the day by burning wolf dung (as it made a good dense smoke). To make different colored signal smokes, the soldiers mixed different herbs with the burning dung. If invaders were seen signal smoke would be sent up along the wall and reinforcements would be sent to repel the attack. Around June 1, 1644, after rebel forces had entered Beijing and overthrown the last Ming emperor, Ming General Wu Sangui (吴三桂) colluded with the commander of the Qing troops. Wu Sangui opened the gates of Shanhai Pass Fortress and let the Qing troops in. 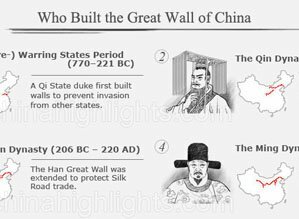 Within a week the Qing controlled the capital and China&apos;s last dynasty had begun, one which forbade Great Wall building. So that day was also the last day of the Great Wall as a defensive barrier. This was actually the third time a dynasty led by a northern nation began with a breach in the Great Wall. 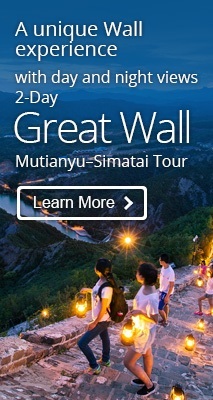 For more on the Jin and Yuan dynasties and other interesting Great Wall stories, see Great Wall History. One who fails to reach the Great Wall is no hero. 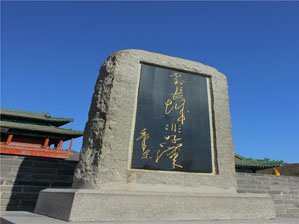 Over the ages, the Great Wall has inspired many a poem and song, none more telling of its remoteness that the words of Wang Zhihuan in the Tang Dynasty: "Spring winds ne&apos;er pass Jade Gate Pass". For the full poem and what inspired it see our page on Yumenguan. "One Who Fails to Reach the Great Wall Is No Hero"
This sentence is from one of Mao Zedong’s poems. The spirit in which it was written has developed a proverb meaning: "He who can&apos;t overcome difficulties is no hero." "Pure Peaceful Happiness, Liupan Mountain"
Waiting&apos;s ended for the south-flying geese. Counting the journey&apos;s twenty thousand li*. The red flag freely furls in the west wind. *"A li is half a km; Mao had journeyed 10,000 km on his war path by 1935. The "long tassel" represents the Communist uniform and the "dark blue dragon" the Kuomintang. 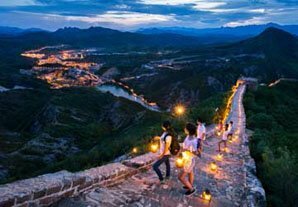 Now it affects many travelers and attracts them to visit the Great Wall. Many people put the Great Wall on their must visit list to show "Chairman Mao spirit". The Great Wall at Mutianyu even has &apos;loyalty to Chairman Mao&apos; inscribed on the hillside in big characters (忠于毛主席). Before the group tours, cablecars, and paved steps up to the Great Wall, people had a tough trip and climb to reach the Great Wall. Persistence and strength were required. You can make your "hero" experience even easier and more fulfilling with one of our Beijing tours, which can be tailor-made to your requirements. People who are unwilling to be slaves! To build our new Great Wall! China&apos;s banknotes and coins also support its Great Wall culture. 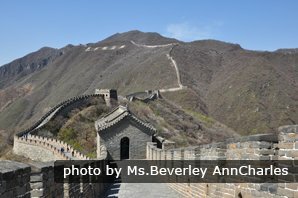 According to incomplete statistics, there are more than 100 pictures of the Great Wall on banknotes and coins issued by more than 30 banks in the last 100 years. The first banknote with a Great Wall picture: In 1914 the Republic of China issued the first two jiao banknote with a Great Wall picture. This set of banknotes is very rare and the price is very high as a collectors item. Since the People’s Bank of China was established, five sets of banknotes had been issued, but only two bills have had Great Wall pictures. The first set, issued before the establishment of the People’s Republic of China, had the Great Wall on its 200-yuan banknote. On the fourth set, issued in 1988, the Great Wall is on a red 1-yuan banknote, now rarely used. The current fifth set of Chinese banknote doesn’t feature the Great Wall. For more on these, see China&apos;s Money. The first set of Beijing Airmail stamps was issued in 1927. It includes a picture of a plane flying over the Great Wall. After the establishment of the People’s Republic of China, the State Post Bureau has issued many stamps featuring the Great Wall, including ordinary stamps, commemorative stamps, souvenir stamps, and first-day covers. Now these banknotes and stamps have become collectors items. Maybe you have one or two of them. 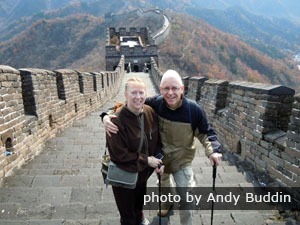 The Great Wall also has many fascinating true stories and interesting things. 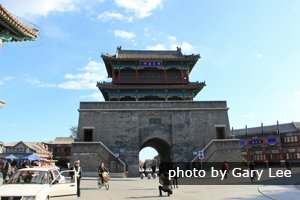 If you want to hear more while standing at the scene of the story, just tell us your interests and requirements and we will tailor-made a Great Wall tour for you.